This is a very easy and simple dosa which can be made within no time.You actually don't need to plan ahead since there is no fermentation etc..and these dosas do not have a particular shape as you just need to spread the batter on the pan. Mix sooji,rice flour,jeera and chillies. Add lots of water and salt as per taste. Let this batter stand for about 20-30min. Sooji absorbs water so the batter will thicken. Add more water to make the batter watery. Heat a non-stick pan and drizzle some oil. 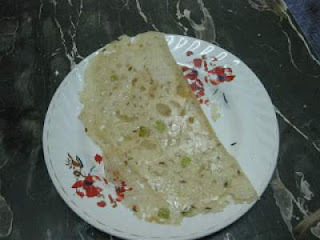 Take a laddle full of batter and spread it from outside(opposite to the normal dosa). Let it cook on both sides. Note-Add some chopped onion to the pan and then drizzle the dosa batter on it to make onion rava dosas. thanks Bina ! do let me know..